I'm honoured, thrilled and stunned to be able to say I found out earlier this week that I got a Canada Council grant for a YA book I've been working on! To have this vote of confidence from Canada Council is such a heady thing. I'm over the moon and have never felt more like a Canadian writer. Recently I also learned, to my immense joy, that Yesterday made the Canadian Library Association's Young Adult Book Award shortlist along with 9 other fantastic books: 40 Things I Want to Tell You (Alice Kuipers), Bright's Light (Susan Juby), The Calling (Kelley Armstrong), The Last Song (Eva Wiseman), My Book of Life by Angel (Martine Leavitt), One Good Hustle (Billie Livingston), The Reluctant Journal of Henry K. Larsen (Susin Nielsen), Such Wicked Intent (Kenneth Oppel), and What Happened to Ivy (Kathy Stinson). You can see the complete lists for the CLA Book of the Year for Children Award, the Amelia Frances Howard-Gibbon Illustrators Award and the CLA Young Adult Book Award here. Congrats to all the CLA-nominated authors! Before these two wonderful pieces of news good luck was in short supply (the publishing business is hard, hard, hard) and it means so much to me to have this recognition from other Canadians. It would be impossible for me to overstate that. And if it happens that there's another tough patch around the corner, these two things will see me through it. 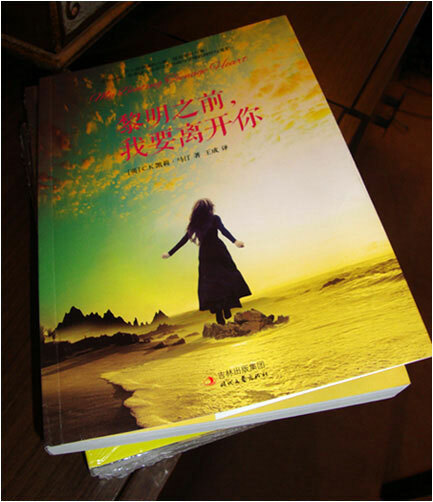 Finally, before I go I want to share the stunning cover of the Chinese edition of My Beating Teenage Heart. Four copies arrived from my agent yesterday and I keep wandering over to the sideboard to stare at them. Aren't they lovely?